The parish of Welborne lies in central Norfolk about 6 miles southeast of the market town of East Dereham. Welborne sits in lanes about 2 miles south of the A47 road which crosses Norfolk from King's Lynn to Norwich. There is not much to Welborne, just a strip of properties along an east to west running lane with the church at its eastern ended junction. Welborne sits on a broad plateau of land sitting at a height of roughly 45 metres above sea level which forms a tongue of land between the valleys of the Yare, to the south, and the Tud, to the north. The area is almost totally used for arable agriculture with beet, cereals and oil seed dominating the cropping. 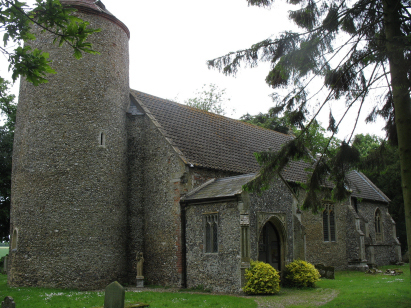 Welborne parish is another of the tiny parishes which dominate Norfolk, it covered less than 750 acres and is almost an adjunct to its larger neighbours (Mattishall & East Tuddenham). All Saints church sits at the eastern end of Welborne's lane where it meets another lane running south from the Mattishall/Norwich road. As you approach from the west the church is almost hidden behind massive trees but an attractive lych gate grants access to the churchyard on the southern side. 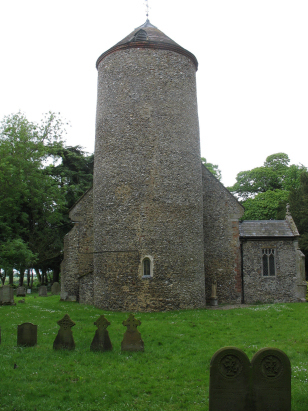 The curious round tower is its obvious main feature and Pevsner dates this to the 12th century commenting on the lack of features which has necessitated entering sound-holes for the bells into the conical roof. The remainder of the building is not as old, the nave being 15th century and the chancel being replaced during the 1870s when a general restoration occurred. The site is extensively dominated by trees making it tricky to find good angles for photography. A single standard 800-entry register book covers the period of this transcript and runs onwards to finish during the late 20th century. This register is filmed on Microfilm MF595 in the collection of Norfolk Record Office which was used to prepare this transcript. The film is adequate to the task although at times the register becomes a little erratic clerically with marginal entries as well as out-of-date-sequence entries and a few omissions of part of the dates. The handwriting was mostly acceptable and it is hoped that few misreads will have occurred as a result.